There is truly nothing as good as sharing something you love to do. Tracie was remarking just the other day how good it feels to 'deliver something' in her design work. In cooking, we create something everyday. But building a restaurant, can be a long and slow process with few visible outcomes for a long while. In our case, it has had its ups and downs. This past weekend was an up because we got to deliver on something. We've spent a lot of time planning, but doing it is what we are working so hard towards in opening this and catering allows us to step and create and cook. 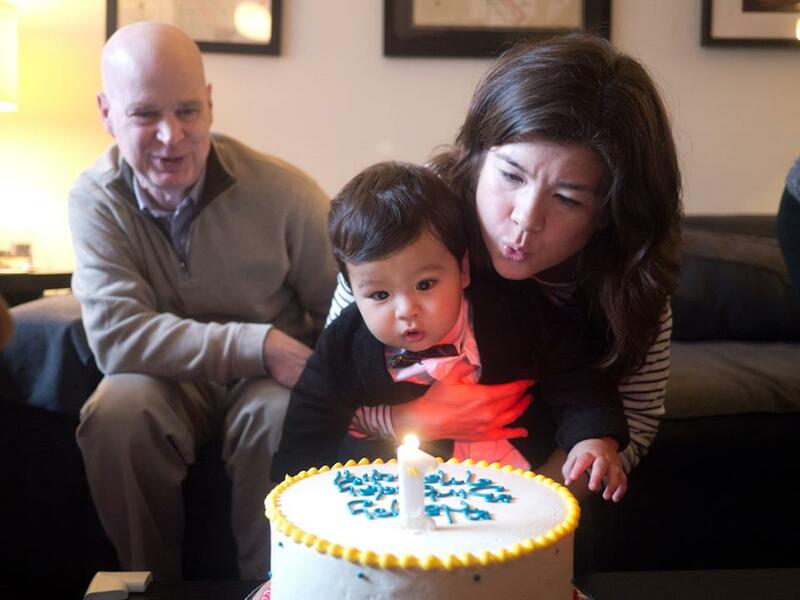 And we especially get joy and love cooking for my friends and family, so it is that much more rewarding when our friend Alaina dropped us an email and asked us to cook for her son's first birthday. We were ecstatic because we love Malcolm, he is quite possibly one of the most joyful babies we've ever met. One smile from him just melts away all the worries in the world. That's not to say we weren't a little nervous. Sure, we've done quite a few large events, but our friends are foodies of the highest caliber and they usually won't hold any punches in saying that something was mediocre or needs a little more development. That is part of why they are our friends. So, we wanted it to be great. We always do, but especially to share with a large group of our peers and mentors. We know it went well because Anil's mom Mira was in and out of the kitchen throughout the course of the morning and afternoon and kept complementing us on the food. It feels good when someone who has years of experience behind the stove says your food is good. That means more to us professional cooks than any industry writer or chef's opinion. We promised Mira (Mrs. Dash) that we'd share our flour tortilla recipe and we figured why not share it with everyone else as well. After all, it's taken some time to perfect this recipe to what it is today. In fact, I might still be working out how to get ours to have the right basic form were it not for the work of Lisa Fain of Homesick Texan or Diana Kennedy our favorite author and expert on Mexican cuisine. Our recipe evolved out of their efforts taking their basic form and ideas and building on it from there. That said, you'll be hard pressed to reproduce the flavor and texture of ours without the exact ingredients that we've gathered from New York regional sources, so when you make these at home, they'll be your own recipe. Combine the rest of the dry ingredients and mix well with whisk. Remember to save the 16g or so for bench flour. Place dough into container and rest at room temperature for at least 10 minutes or store in fridge until ready to use. If you have a scale handy, then divide the dough into 8 pieces at roughly 35g. If you don't have a scale, it's easy to eyeball divide the dough by rolling the dough out with your hands on a clean dry cutting board (no flour needed for this). Roll it out evenly by first shaping it into an even log. Start with your hands in the center and keeping your palms flat roll out towards the edge and form the dough into an even log. Shape with your hands to make it even. Divide in half, divide the halves in half, and the quarters in half. You now have 8 fairly even pieces. Roll those in your palm into balls and flatten with the palm of your hands to form even disks. Heat your pan, griddle or comal to medium or medium high heat. Lightly dust with your bench flour a clean dry surface. Place disk of dough on the floured surface, turn over to coat with flour. Place the rolling pin in the center of the disk of dough and with your hands on the outer middle of the rolling pin, palms flat, press firmly and roll forward. Repeat from center downward. Flip the dough and rotate 45 degrees. Repeat. Gradually you'll achieve a round shape. By holding the rolling pin flat and rolling the end from center to edge you can stretch the dough into cleaner and more even circles if needed. Flip and turn as needed, keeping the dough dusted. Repeat. Practice makes perfect here and don't expect to get good too quickly. We've made hundreds and still don't always get a perfect circle. And hey, it tastes the same either way. We don't add oil to our pan or well-seasoned griddle. We cook over dry heat. There is enough oil in the dough to keep it from sticking to the pan if it's heated properly. We keep our cooked tortillas in a covered container until we're done cooking all of them. They are usually still hot by the time we're ready to serve them with the fillings. If it's been some time and they've cooled off. We use a water bottle sprayer and mist each side before reheating them briefly in a hot pan. The pan must be hot, or the dough will stick to the pan at this point. Work fast and you needn't re-heat. But if you've made a larger batch, you'll want to know how, so there you go. Now, enjoy and share with your friends and family. If you were smart your doubled or tripled your first batch. Lay out the tortillas on a sheetpan and allow to cool to room temperature before storing in a plastic bag or lidded container. Otherwise you'll have a stuck together messy mass. They freeze well and you can re-heat on the stove or even in a toaster oven from frozen in a pinch. 2 We use: Ronnybrook, GetNyMilk, and a host of other local producers. 3 We buy ours from Cayuga Pure Organics' wholesale. In NYC, you can pick some up at the Union Square Greenmarket on Wednesdays and Fridays or Saturdays in Brooklyn at Grand Army Plaza Greenmarket. 4 We use European style butter with about 82% butterfat, but regular American style will work too, it'll just be healthier.